I was recently struck with an illness that left me in unrelenting and excruciating pain for a period of days. I’d never experienced anything like it. Among the worst symptoms was nine and ten level pain that shot through my ear like a knife. 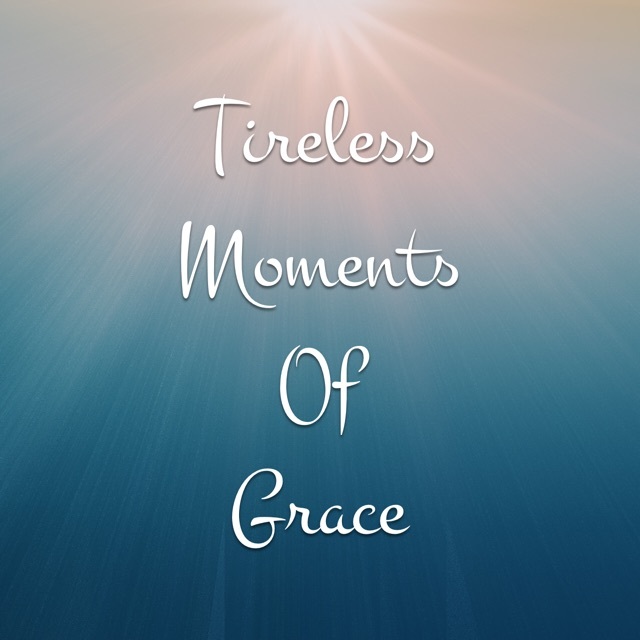 Through this experience, God has given me tireless moments of grace that have equipped me and have demonstrated how tenderly and completely He loves me. Allow me to share them with you! He reminded me that SONGS ARE WEAPONS! Every wave. Every symptom, every pain, every potential lingering effect. As the truth in those lyrics sank into my heart, a quietness, an assuredness, entered the room. My fears faded and the pain subsided for a time. I was reminded that JESUS REALLY DOES MAKE THE DARKNESS TREMBLE - that truth transcends any sickness or circumstance we may endure even as we’re enduring it. That’s why we can anchor ourselves in it in dark and uncertain times. I have carried these words with me throughout this experience and have found comfort and promise that only Jesus can give. As a songwriter and worship leader, you can imagine that my hearing is important to me. So when this illness caused diminished hearing in my right ear, God brought yet another song to my heart, another weapon to wield… I’d recently written a song with my dear friend Haylie Allcott, called, “Forever And Ever,” taken from Psalm 145. I sang it over and over, a declaration that no matter what circumstance I face, I will exalt my God forever and ever! In this earthly life and for all of eternity through Christ my Savior. During the most intense times of pain, my husband would simply sit beside me and watch me. Silently. Intently. Ready to meet any need I had at any moment. During one of these times, I looked at him and was impressed that this is exactly what God is doing for me all the time. We know this, right? We know God is always watching over us and caring for us. But in that moment of grace, God gave me a visual I could liken it to. It made the truth of God’s watchfulness tangible to me. You see, from that moment on, I was able to lay down, close my eyes and picture God watching over me intently. With undivided attention, ready to meet any need I had. It took all the worry away. I could feel my whole body sink peacefully down into rest. I knew He had everything under control. I knew He was watching me. Then the day came. I woke up with renewed energy, not fully recovered, but better. I started out the day in Scriptures about how He is with me and to not fear. It was a mind-set shift. I knew to have wisdom to continue resting so I could continue to heal. But I also knew to move on from it, trust Him, and focus on serving Him. I am grateful. Grateful for the moments of grace that He has shown me, that I carry with me and anchor my faith in. Thankful that this illness wasn’t worse than it was. Thankful for good doctors and medicine. For a comfortable home to recover in. That I have a husband who has cared for my needs inexhaustibly. That I have faithful friends who have demonstrated the power of prayer. That I serve a God who loves me tenderly and completely. I don’t know where the idea came from. I just remember coming to the close of a year when I asked the Lord, “What do you want me to focus on this next year?” And He told me. I got into the habit of doing that each year, not as a new year’s resolution, but as a way to stay pressed into Him. The topics He’s given me have varied over the years. Sometimes it’s a character flaw He wants me to address. Sometimes it’s a truth He wants to reveal. Other times it’s simply a groove He wants to carve more deeply into my soul. But I’ve found two things to be true, no matter the topic. Here's the first...I'll save the second for a "Part 2" blog later this month. I can always apply it to my lie’s circumstances. And that's the key, isn't it? I want to understand what the Word says about the topic He’s given me. I want to know what the parameters are in which that truth operates so that I can walk it out safely and in the way He wants. I look up relevant Scriptures and write them down in my journal. I look up different translations and even find the original Greek or Hebrew meaning of key words in a concordance to help me better understand. 2. Then I look for other Christian resources…. It’s funny. I often don’t have to look very far to find the right resources. It’s not uncommon that they find me…a podcast I subscribe to does a series on the topic, or a friend unwittingly tells me about a new book that’s out. I wait. I listen. I’m not in a hurry when I’m reading Scripture or listening to a podcast. I don’t want my own reasoning to become my guide. 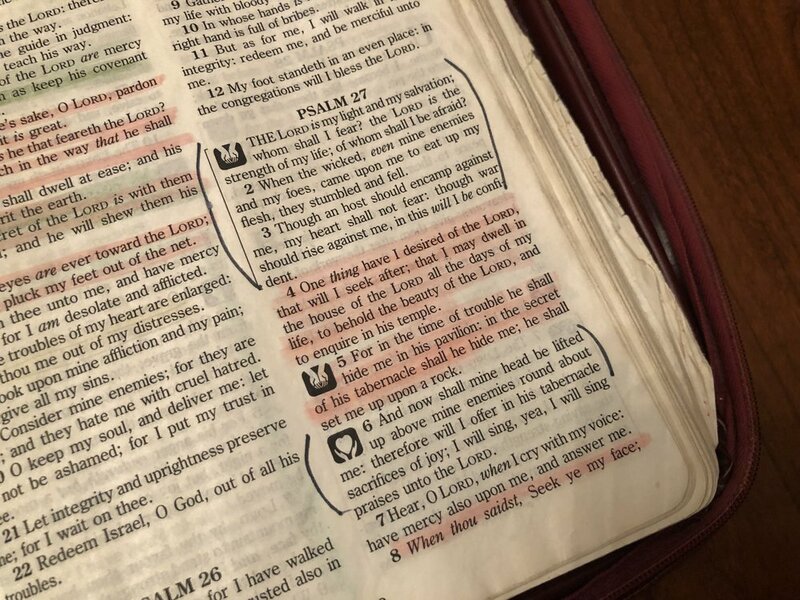 I keep relevant Scriptures in front of me consistently throughout the year unless He leads me to a different topic along the way. I'll listen to the same podcast or sermon series multiple time if it's piercing my heart. And I don't mind reading the same pages of a book over and over if it's ministering to me. The goal is not FAST. The goal is CHANGE. The goal is INTIMACY with Christ. What is it that needs to change in my life, in my behavior or thought process, to apply this truth? God is really good at making this clear, I will tell you. The key is being intentional about incorporating it into the day-to-day routine. I remember light shining so brightly on my conversations at work and with friends a few years back, revealing the extent to which my own insecurities were driving them. Once I saw it, I could intentionally change how I interacted with people because the Lord had given me the tools to do it. Sounds intense, huh? Not always. But it can be, depending on what He’s trying to do in that season. What I can tell you is that it’s worth it. It’s worth it to be close to Him. It’s worth it to see Him moving intentionally to free you from strongholds you may not even realize you have. To prepare and equip you for something you wouldn’t otherwise know how to handle. I know I’m suggesting a very simple thing – to ask the Lord each year what He wants you to focus on – but I’ve found it to be a practical and powerful means of staying close to, and in-tune with, Him and where He’s taking me. It keeps me on a forward path. 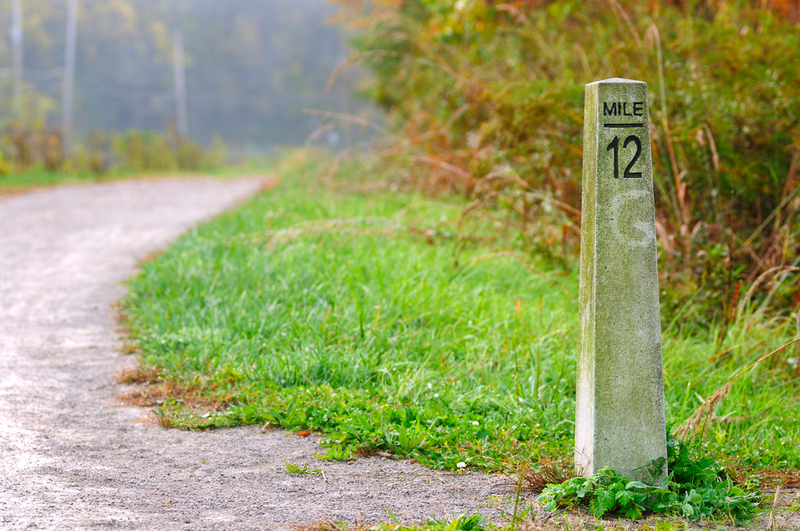 And as I look back, I can see mile markers of His faithfulness along the way. As 2017 closes, what might He want you to focus on in the coming year? Just ask Him. He’ll be faithful to tell you. Stay tuned for “Part 2” later this month! Are you desperate for rest? You know. The kind of rest that lulls you to sleep at night. Rest that shoos away the knots in your stomach and the wrinkles on your forehead. Sustaining rest that doesn’t shatter when your circumstances change or when the path ahead is unclear. The kind of rest that puts the smile on your face that you weren’t expecting. I don’t know about you but I, for one, am just naturally wired pretty tight. This has benefits as well as challenges. I’ve had to be very deliberate about finding sustaining rest and uprooting what once were main-stays in my life…worry, anxiety and fear. Finding rest ultimately comes down to surrender. But surrender isn’t just waiving the white flag and praying for rest. We have a part to play in it. I grew up not really understanding how to apply this passage. I thought if I just prayed sincerely for rest that it would just come. After all, Jesus said to come to Him and He would give us rest. But in order to find sustaining rest, there are two things we need to do: 1. Trust Him, and, 2. Walk in His ways. Can I say something that might sound shocking? God’s not going to take the weight of the world off your shoulders. Notice that we are the ones who have to do the casting. Can we really find rest if, after we pray, we continue to worry and fret about our circumstances? Has that burden really been lifted? Isn’t it up to us whether or not we’re going to carry a burden? We have free will. If I decide to pick up a brick and carry it around all day, I can do that even though the only consequence is that my arm is going to be awfully sore. This is where trust comes in. When we come to Him, we have to trust that He is working in our behalf, so much so, that our rest is not dependent upon what’s happening in our lives or how a situation turns out. But there’s another component to finding rest that takes intentionality as well. The yoke that Jesus is referring to is a wooden beam placed around the necks of two oxen to pull a load together. Jesus is saying that we are to take HIS yoke upon us and learn from Him. In other words, we are to walk in His ways. And by walking in His ways, we find rest. Can we find rest if we harbor resentment or bitterness? Cam we find sustaining rest if we’re easily offended? Can we find rest if our hearts are hardened by pride? Can we find rest if we have habitual unrepentant sin in our lives? In our fast-paced, grab and go society, we want to, well, quickly grab what we need and go. Move on to the next thing so we can get to the next, next thing. But we know it doesn't work that way with matters of the heart. Hit the pause button on your life. Ask the Lord what areas in your life may be keeping you from finding rest. Real sustaining rest. He will be faithful not only to show you, but also to help you uproot anything that may be keeping you from finding rest. The word “hurtful” there in the Hebrew means idol; also, pain and wicked. Growing in deeper levels of trust and surrender is a life long process. No one arrives. And it doesn’t have to take decades of soul surgery to find rest. In I Corinthians 15:31, Paul said, “…I die daily.” And Peter charges us to “…grow in the grace and knowledge of our Lord and Savior Jesus Christ” in II Peter 3:18. We press into Him, earnestly seek Him and His ways, and He does the heavy lifting. He’s the One who ultimately gives us rest. Bold. Sure. Fearless. David has seen God come through for him and has learned to put his confidence in the Lord, as we see in the verses that follow. To “dwell” implies intimacy, familiarity. This verse is a love song! The one thing David desires is not deliverance itself, but relationship. Of course, David wants to be delivered, too. But he understands that deliverance comes out of relationship. And relationship is what he desires most. Back in verse 1, David says that God is the “strength” of his life. “Strength” in the Hebrew there means, “a fortified place, “or “a place of safety.” David’s place of safety was the Lord Himself! It was because David learned to put his trust in God that he could recognize the greater desire of his heart. And so it is with us. We get distracted by the things that make us afraid, and that becomes our focus. Our desire begins to center around seeing the outcome we want and we find ourselves in angst. Sometimes our desires are based on inherently good things. For instance, desiring to fulfill God’s purpose in our lives is noble, but fear of failure even in that, can become a driving force that makes success an idol. But when we lean into the Lord, and remember all He has done for us, that He has been our shield, our defense, our guide, our comforter, our provider - our faith rises up as we put our trust and confidence in Him. Our problems become small in the light of Who He is. It is then that our hearts become free and we remember that, truly, the one thing we desire is simple. Relationship with God. We remember that all of our circumstances in life are just that....circumstances. They will pass. Big and small, they will pass. Some tragic, some overwhelmingly joyful, but they will pass. Seek God Himself, not for what He can do for you but for Who He wants to BE to you! Only God can satisfy your soul.